TUCSON, Ariz. - KGUN9’S Operation Safe Roads is dedicated to avoiding injury and death on our streets. How those streets are designed can play a big role. The City of Tucson is pushing for complete solutions to make streets work better for everyone who uses them. When you go out on the streets, as a driver, as a pedestrian, as someone who uses transit, do you ever have the feeling there is something missing from Tucson streets? 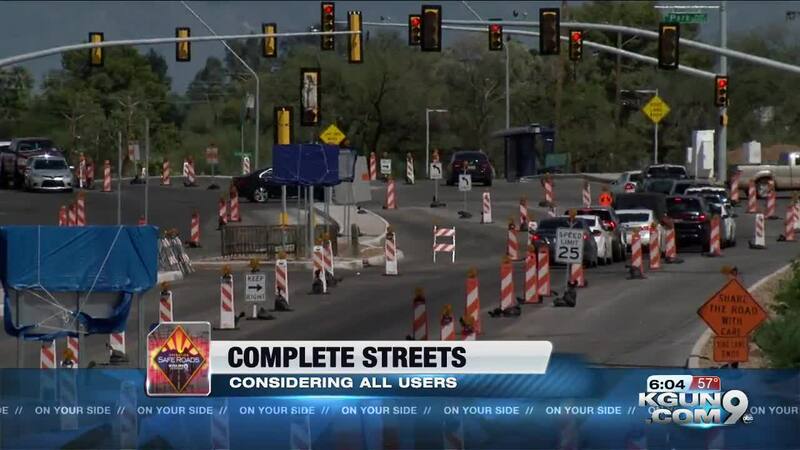 Well the City of Tucson is hoping to remedy that through a program it calls "Complete Streets". It can be a challenge getting around Tucson streets no matter how you try to do it. Anna Saville is almost 93 years old. She says potholes in streets and sidewalks make it tough to roll through with a walker. "And there's places where there's trees overlapping where pedestrians are walking..It hits them in the face. They need to trim all that stuff down and fill all the potholes up." Now the City of Tucson and community groups like the Living Streets Alliance are developing the Complete Streets policy to make sure plans for new streets and to improve old ones build in features so they work better for everyone who uses them. The idea's already planned for a section of Roger Road near Romero. It's slated for better pavement, bike lanes, sidewalks, landscaping and drainage. Assistant Tucson City Manager Alert Elias says Complete Streets considers everything from truck traffic to people in wheelchairs who can't find a suitable sidewalk. "They're probably going down a travel lane or going down a shoulder in a way that he's not safe. So the idea is, you want to be able to consider that means of mobility when you are creating and investing in the transportation system." And with a lot of concern about vehicle and pedestrian deaths, complete streets aim to improve safety with smarter design and public education. The city wants your input on how the Complete Streets project moves forward. Make your voice heard on the city's Complete Streets website .